EcoPlus Commercial Air Pumps are designed to provide oxygen in hydroponic systems, fish farms, and aquariums. The pump is constructed out of a high-quality ZL 102 aluminum allow case with an oil-free lubricated design for purified air. 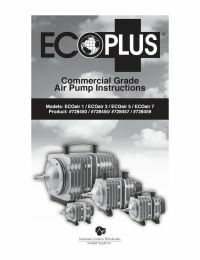 The durable EcoPlus air pumps are able operate with little noise, and include a chrome air manifold. EcoPlus air pumps should never be used or placed in water.